Logan Marshall will be a senior at Manteo High School next year, so it’s hard to imagine that he’s already produced to excellent films on surfing on the Outer Banks. His first film was Limitless, a 22 minute short that had its first showing at the Dare County Arts Council’s Surfalorous Film Festival last September. His new film, Limitless, is an hour long and shows remarkable improvement—and the first film was very good. 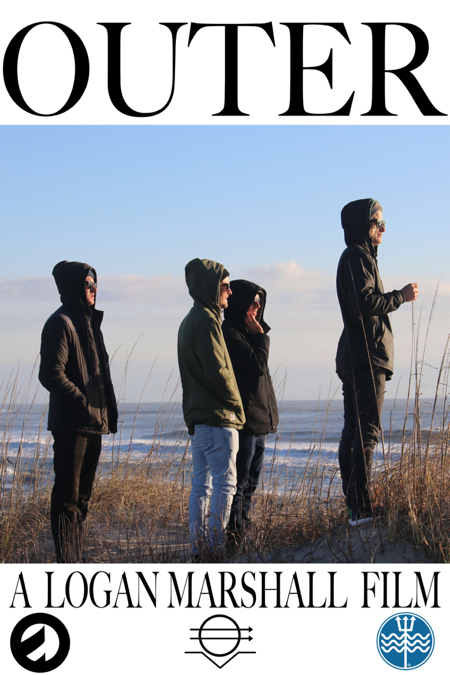 Outer premiered on Sunday at the Pioneer Theater in Manteo on Sunday with second showing at the Outer Banks Board Company Turesday eventing. In some ways the movie picks up where Li witless left off, examining an evolving culture in the surf community. There are some very real differences though. The first movie looked at how different generations view surfing on the Outer Banks. In Outer Marshall looks at where the sport has been and where it’s going. Through interviews and some really remarkable footage—which Logan shot himself—the story of an evolving culture that sees itself as able to perform as well as any other surfer anywhere takes shape. Jesse Hines is arguably the most successful pro surfer to have grown up on the Outer Banks. Now the owner of Surfin’ Spoon in Nags Head, in the movie he touches on what it was like to be professional surfer, what some of this pressure were and what he had to do to maintain his status. He spoke about the accident that occurred at age 14 and how the procedure to correct it eventually led to needing hip replacement surgery by his early 30s. To balance his narration, there is some astonishing footage taken during a March storm this year, where he is riding 12’ and 15’ waves. The younger surfers also have a voice and that is especially interesting. One younger surfer in particular—Bo Raynor—is worth watching. He is featured in the movie and what he demonstrates on the water is impressive. He’s finishing his Junior Pro career and there is a very good chance that he will be joining the pro tour next year. This is a film worth seeing. Yes it’s a surf film, but it touches on other themes and topics, making it more about a way of life and an evolving culture. The next Outer Banks showing of the film will be at the 2018 Surfalorous Film Festival in September. Joe Lamb Jr., & Associates is always ready to help our guests enjoy their Outer Banks stay.